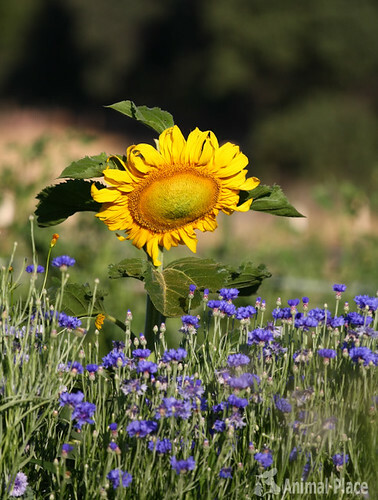 This is one of the sunflowers at the sanctuary's vegan micro-farm. The flower is telling Important Business to some edible bachelor button flowers, probably that they are edible and should be concerned. I don't live in New Hampshire, but if you do, walk on over (b/c everyone can walk to their destination in NH, amirite?) Lyman Orchards and enjoy their sunflower maze. I have been through corn mazes, but I feel sunflower mazes are more awesome because, hello! sunflowers!